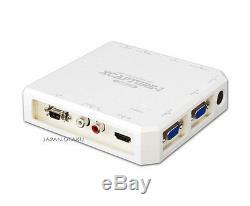 Micomsoft USB3.0 HD CAPTURE UNIT XCAPTURE-1 N. This is Brand New Micomsoft JAPAN. This is Not Chinese Illegal copy products. XSYNC - 1 is a synchronous separation unit that separates the composite synchronous signal of the game machine 21 pin analog RGB signal (horizontal synchronization frequency 15 kHz) into separate synchronous signal (H synchronization and V synchronization). 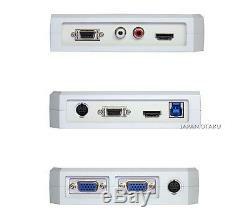 It is a special video device that can be used in combination with SC-500N1 / DVI, SC-512N1-L / DVI, XCAPUTURE-1. It is also possible to distribute analog RGB video signals and sound and monitor without delay. Examples of game machines that can be captured in combination with XSYNC-1 Playstation / Playstation 2 (only when component setting is RGB) · Super Nintendo Entertainment System · MegaDrive / MegaDrive 2 (When using XMD series or connection cable) · Sega Saturn About Arcade game board Although there are things that can be displayed, some parts of the video are distorted, missing, not displayed at all, special substrates that can not be displayed even using XSYNC - 1 may be present. Video /S+ sound hybrid cable. In the case of plural simultaneous orders. If you have any question, please contact me. These charges are the buyers responsibility. The item "Micomsoft USB3.0 HD CAPTURE UNIT XCAPTURE-1 from Japan" is in sale since Thursday, August 17, 2017. 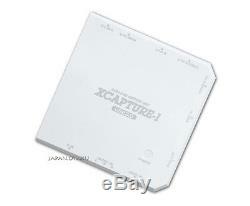 This item is in the category "Video Games & Consoles\Video Game Merchandise".otaku" and is located in japan. This item can be shipped worldwide.